Opportunities to Serve at St. Francis Retreat House. Volunteers are a key component of our Retreat House and help with many necessary tasks. 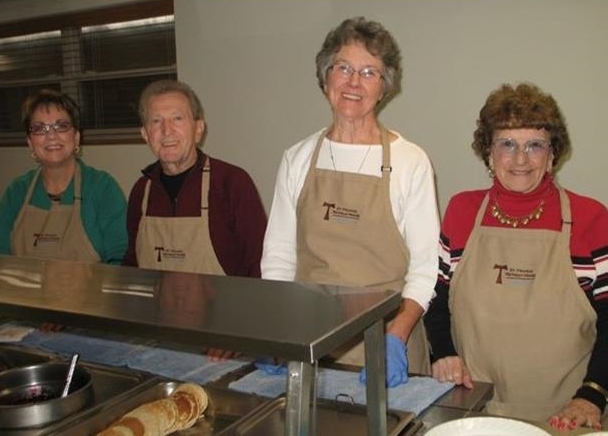 You can find them serving meals, setting tables, helping Brother Ed Skutka at the dishwasher, kitchen prep, light housekeeping, gardening, landscaping, lawn care, snow removal/salting, general maintenance, mailings, office helpers, greeters, welcomers and retreat promoters. We could not do without them. But even more, volunteers find they have a need to give. There is peace in raking leaves in the service of others, perhaps people they may never meet but whose lives they touch with simple acts done just for love. There is joy in putting stamps on envelopes and grace in the camaraderie of deciding who should mow and who should dig. Those who volunteer their talents often say that they receive far more than they give. And it’s fun! Come join us: you may find you cannot do without it! Why volunteer? *A twenty year study, “The Health Benefits of Volunteering”, reports that those who volunteer have lower mortality rates, greater functional ability and lower rates of depression later in life than those who do not volunteer. * Enjoy an annual appreciation dinner at years end. Call us today.We will be happy to have you join us! “I love the peacefulness here”. “It makes me happy to share my time and to meet people”. “It’s like my second home”. We depend very much on volunteers to help us with our retreat ministry here at St. Francis Retreat House, especially in our dining room. If you have some free time and are interested in getting more involved with us here, please call Keren Donato, our Director of Volunteers, at 610-258-3053 ext. 15, kerendsfrh@rcn.com, or fill out form below. We also have several volunteers who serve from time to time as “greeters and ministers of hospitality” for those arriving for retreats. These are our SFRH Ambassadors. For more information, please contact Bro. Mark Ligett, OFM, at 610-258-3053 ext 34. Comment, address, other phone#, etc.